The Northeastern Woodlands include three very different regions occupied by two distinct linguistic groups : Algonquian-speaking peoples lived on the Atlantic seaboard and the southeastern part of the Canadian Shield while Iroquoian-speaking peoples lived in the Great Lakes - St Lawrence lowlands. 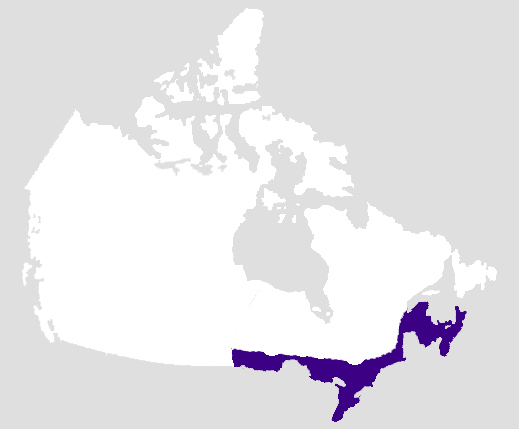 Algonquian-speaking groups extended from Lake Superior to the Ottawa Valley, and east to the Atlantic coast through present-day New England and the Atlantic provinces. On the Atlantic coast, groups like the Mi'kmaq and the Maliseet benefitted from both coastal and inland resources. Food from the sea included fish, shell fish, seals, eels, dolphins and small whales; however, especially in the winter, big game like caribou or deer was also hunted. The abundant food source allowed a semi-sedentary lifestyle, with seasonal moves between coastal habitations and more permanent inland camps. 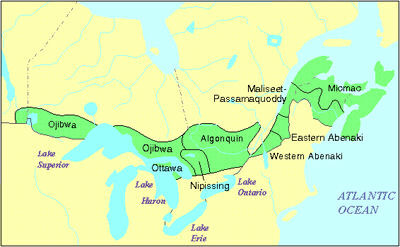 Further inland, other Algoquian speaking peoples lived on the Canadian Shield with more limited resources. They included the Ojibwa (eastern Lake Superior), the Algonquin (Ottawa River and tributaries), the Abenaki (southeastern Québec). These groups were nomadic hunters-gatherers; deer was the most important game animal except in the north, where moose and caribou were the staples. Peoples in the area gathered and ate a variety of berries, nuts, tubers and plants like wild rice. 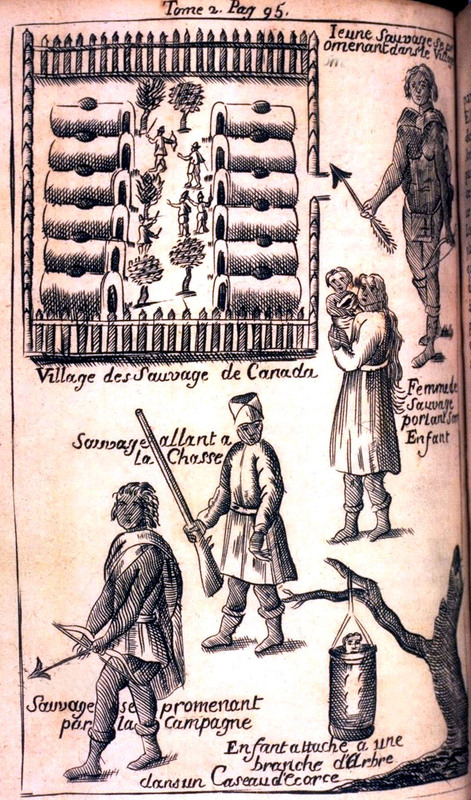 Fur bearers, especially beaver, were significant to trade-based economies of the Canadian Shield peoples, who traded meat, furs, medicinal plants and berries with southern peoples in return for agricultural products like corn and squash. The peoples of the Eastern woodlands could make use of the extensive lake and river system to travel and trade. 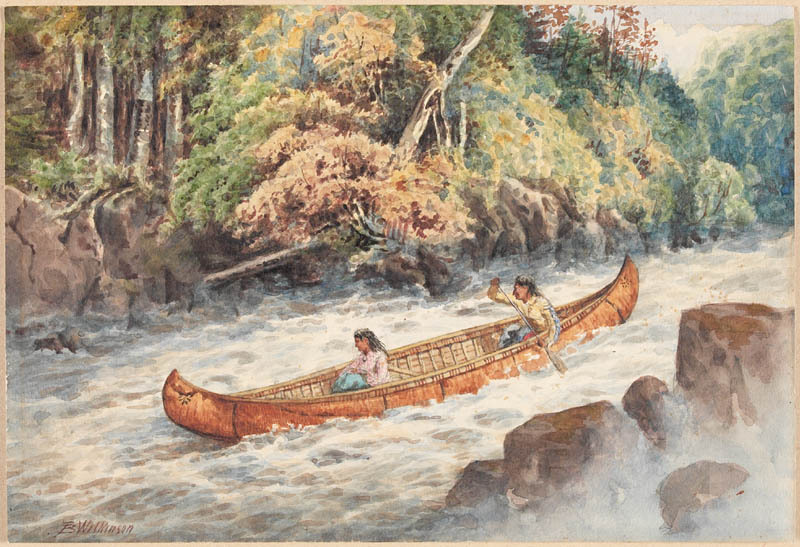 They developed the birch bark canoe as the ideal mode of transportation travel by rivers and lakes separated by narrow watersheds or portages. 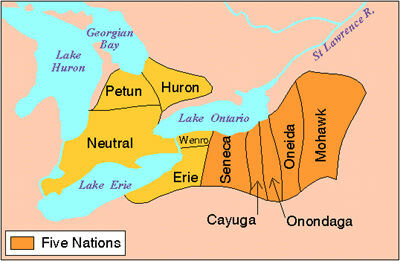 Iroquoian-speaking peoples (the Iroquois Confederacy of Mohawk, Oneida, Onondaga, Cayuga, Seneca, Tuscarora, along with the Hurons, Petun and Neutral) lived around the Great Lakes, in areas that are now now southern Ontario, northern Ohio, Pennsylvania and New York. There they benefitted from fertile lands and could grow corn, beans and squash (also known as "the Three Sisters"), but also sunflowers (for oil) and tobacco. The Three Sisters is an Iroquois farming system. Corn, beans and squash are planted together, or interplanted, in mounded hills. The smallest of the sisters (representing the bean) was harvested in late summer. The second sister (representing squash) was harvested at the beginning of fall and the third sister (corn) was harvested in late fall. Interplanting has numerous ecological benefits. Beans, a member of the legume family, are nitrogen fixing plants, meaning they take nitrogen from the air and convert it into a natural fertilizer. When the beans are harvested, the fixed nitrogen in their roots is released, and fertilizes the ground for the next year’s crop. The corn acts as a support for the beans, while the squash grows out over the soil helping to control the weeds. Source: Eames-Sheavly, Marcia. The Three Sisters: Exploring an Iroquois Garden. Ithaca, N.Y.: Cornell Cooperative Extension, 1993. Farming was complemented by hunting and harvesting berries, nuts, tubers and plants as well as maple and birch sap. Farming provided an abundant and stable food source which allowed the development of a large population. The Great Lakes was the second most densely populated area of pre-Contact Canada. 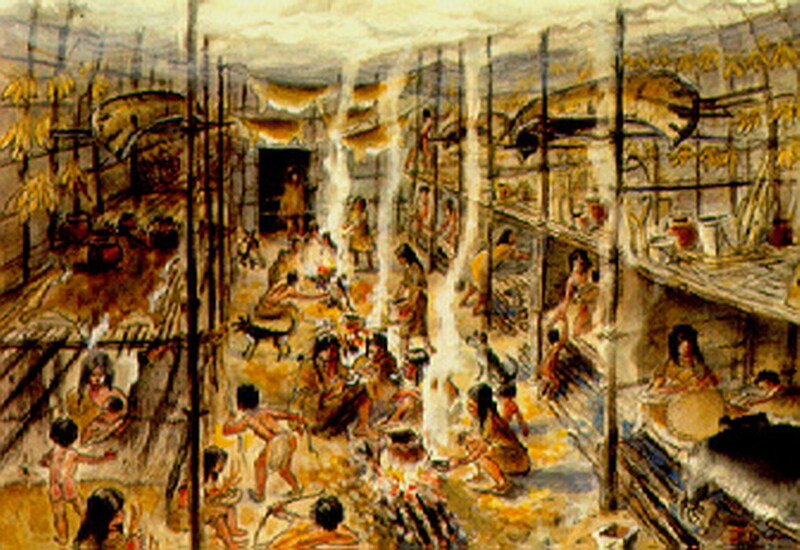 The Iroquoian-speaking peoples lived in large villages of around 2,000 people characterized by the long house. Villages were semi-permanent; their location would be changed every 10 to 15 years, when the fields around the villages were no longer fertile enough. Long houses were shared by 6 to 8 families, with a central fire (hearth) for each family. Living and sleeping areas were on the sides, and storage areas overhead. The Iroquoian-speaking people of the Great Lakes were wealthy societies that developped complex political and economic systems and high quality crafts. 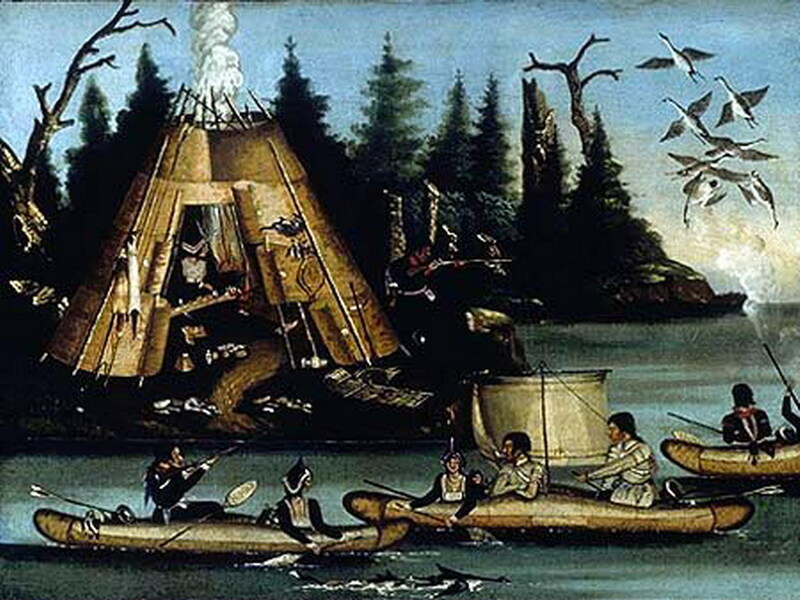 The Iroquois and the Hurons had sophisticated political and religious systems, with a grand council of fifty sachems or chiefs chosen by the clan mothers which met to reach consensus and take collective action. 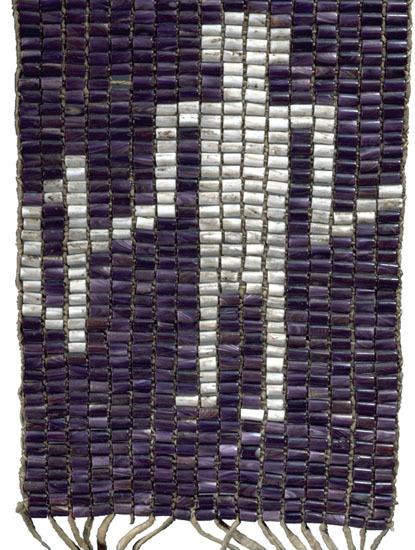 They developed intense economic exchanges among themselves and with their Algonquian-speaking neighbours and developed a form of currency called wampum (shells sawn over hides to form distinctive patterns).